St.Michel-en-l'herm, The abbeye du St Michel-en-l'herm. Originally it was the island of 'condet' (meaning meeting of two rivers or more correctly two islands) with a fishing village back in the time of the Gauls, it stood out in the former bay of Picton, now the Marais Poitevin, even though it's only 17m above sea level. The village with it's typical low whitewashed houses, around the large church, is today on the busy D746 which crosses the polders of Triaize on route to L'Aiguillon-sur-Mer. 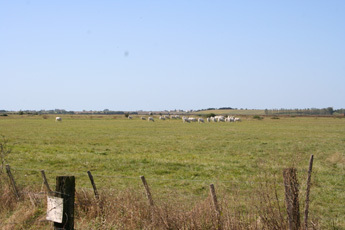 Chaux Farm. Just north of St.Michel-en-l'Herm this farm is built on a hillock of millions of oyster shells, whether it was for protection from the sea that would have lapped at its door or not nobody is sure, but still an interesting sight. It is the last of what was a huge number of such piles, the rest were used for grinding into fertilisers and feed for chickens. Also amongst the oyster shells was a whales jaw bone which is now at the Royal Abbaye. 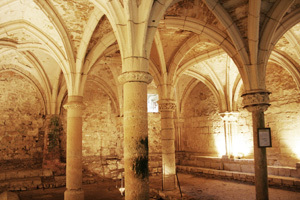 In 682 the monks from Noirmoutier founded a priory, in what was then a deserted place "in eremo" (in the desert or en l'herm), by the orders of the bishop of Poitiers. It was seized by the Vikings in 877, turned into an Abbey in the 10th century, but was destroyed by fire in 1048. Each time the abbey recovered and from the 12th to 16th century the monks undertook drainage works on the Marais Poitevin including the " canal de Cinq Abbes" the first of the major drainage projects to recover the marsh lands. The Wars of Religion(1562-98) saw great destruction when the protestants from La Rochelle attack the abbey in 1569 killing several hundred Catholics who had taken refuge there, before sacking the treasury. 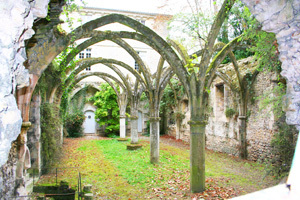 In the 17th century it was again restored by Benedictine monks of St.Maur directed by Francois Leduc who under took the rebuilding of the refectory, lodgings of monks and abbots. The 19th century saw the rebuilding of the Gothic chapter house and calefactory who's vaulted arches arise from 4 pillars. 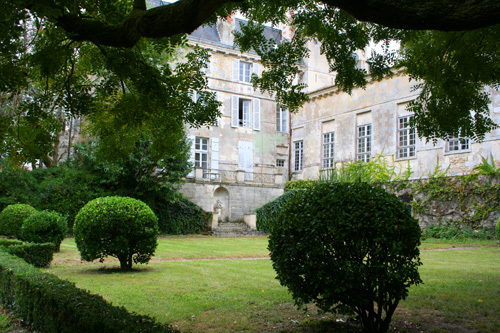 With the Revolution it was deconsecrated before being sold along with the Chateau-de-Abbeye as a national asset. Today the parts of the Abbey are open to the public ( see information office in main square for detail and tickets) who can view the 11th century church and 12th century chapter house which contains the tomb of abbot Aszo,the warming room of the 13th century and 17th century refectory. Photo Gallery of Abbaye Royale de St.Michel-en-l'Herm. Museum Andre Deluoc. 1, rue de l'Etendard. St.Michel-en-l'Herm. Tel. 02 51 30 21 89. Exhibition of 150 sculptures in stone, marble and wood from 1929 to 1995. See full details of musee Andre Deluoc. Open: 15/6 to 15/9 Tuesdays to Sundays 15.00 till 18.30. Tarif: 3€ under 12 years old free. La Rose Tremiere. 4,rue Eglise. Tel. 02 51 30 25 69. Le St.Michael. Bar Restaurant. Tel. 02 51 30 20 19. Camping; Camping des Mizottes.41, rue Anciens Quais. Tel.02 51 30 23 63. La Dive. 12 rue Mer. Tel. 02 51 30 26 94. Taxis; Taxis Auvinet. 3, rue Grands Murs. Tel 06 64 88 66 87. Paillat. 4, Chemin du Booth des Rats. Tel. 06 20 37 32 58. Taxis Cote de Lumiere. Rue Basse, Tel.02 51 27 13 33.